Warwick’s 2017-18 Pulse survey identified a range of emerging or ongoing themes for consideration. In recognition that autumn term would present a challenge for drivers, additional temporary parking provision was made available to help meet demand while Kirby Corner multi-storey car park is under construction. 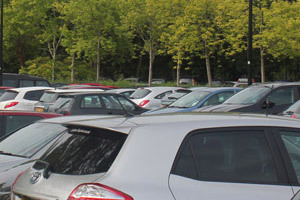 Temporary car parks were opened on Westwood, on the Science Park and at Lakeside Village, and overflow parking was created with track matting on Westwood and at Leighfield Road. Additionally, as staff moved to the Beehive in Westwood Business Park, they changed parking habits to utilise provision there. Kirby Corner car park is the second new major multi-storey aimed to move all car parking over time to the periphery of the campus, to improve the campus environment and reduce congestion. This facility for staff permit holders will hold 1,300 cars with direct access from Kirby Corner and Gibbet Hill roads, and is due to open later this month (28 January, 2019). 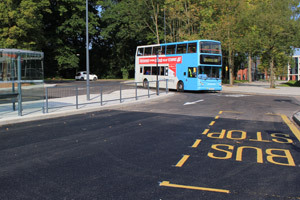 From this date, a revised University shuttlebus timetable will be in use, connecting the new Kirby Corner car park to the bus interchange/Gibbet Hill throughout mornings and evenings as well as via the regular daytime service. Opening Kirby Corner car park will enable us to close car park 7 on Central Campus, to make way for the new Faculty of Arts building. Closing old parking facilities and creating improved facilities around the highway periphery is part of the transport strategy to improve access and egress from car parks for drivers and reduce vehicles in central areas, improving the environment for pedestrians and cyclists. To provide an additional option for Central Campus and non-permit holders, we also intend to create a new car park accessed via Bluebell roundabout. Cryfield Village car park will provide surface parking for around 430 cars adjacent to the new spine route which will link Gibbet Hill Road to the new Sports Hub and will be available to permit holders and pay and display users. Work will start on both projects imminently. It's great news that the University secured a hybrid planning application in November 2018, enabling more car park spaces to be provided in the future. Congestion remains a big concern on the approaches to campus and particularly impacts those leaving Central Campus car parks in the evenings. To help spread the peak travel, and hence road congestion times, the University has encouraged the use of flexible working where appropriate. Schemes such as Warwickshare (car sharing) and the Multi-Mode permit trial are in place to reduce the volume of cars commuting to and from campus. Investment in and support for use of other modes of transport is also key, such as improving cycle facilities and routes, and working with the bus operators to introduce new routes and increase the capacity on existing services. Longer term, Warwick is seeking to lobby for road and rail improvements. 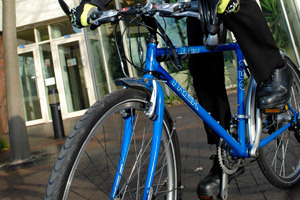 Warwick is in regular contact with both councils (Coventry City and Warwickshire County) to discuss transport issues. The new campus masterplan development, which is nearing conclusion, will propose more investment in making alternative travel options available and in encouraging and supporting their use. Planning continues to ensure disruption is as minimal as possible while different projects take place throughout 2019. We are also due to implement a digital signage scheme, starting Easter 2019, providing ‘real-time’ car parking space information. The University is working constantly to create solutions to problems and appreciates your feedback and suggestions. If you have any views you’d like to share with the Estates team that aren’t addressed above, please use the online form. Thank you for your patience throughout these ongoing improvement projects.